When contemplating climate change, it's nearly impossible not to feel an overwhelming sense of pessimism and finality. The gradual warming of the Earth's surface can start to feel like a far-removed concept even for well-versed believers of the science. Individuals may see it as a monumental problem, but not necessarily something that they can see the effects of in their own backyard. The residents of Sitka, Alaska, a collection of islands adjacent to the Canadian province of British Columbia, no longer have this luxury. Their backyards are old-growth forests, filled with a variety of tree species including the yellow-cedar (Callitropsis nootkatensis), a tree imbued with cultural significance for the native Tlingit tribe as well as being a valuable export for the local logging industry. Mysteriously, these trees began to stand dead in the forests where they used to thrive and while death is a normal part of the life cycle, the scale of the yellow-cedar mortality indicated something was amiss. After early investigations eliminated the suspects normally responsible for large-scale tree death, science gradually discovered that these organisms are dying as result of climate change. The fine roots of the yellow-cedar tree are, predictably, vulnerable the the intense Alaskan cold but are ironically protected from these temperatures by the formerly reliable snow cover that insulates the ground through the winter. But as temperatures increase and the snow melts increasingly earlier in the season, the unprotected tree roots are fatally surprised by sudden cold snaps. Over time, this has stressed some clusters and completely killed others having no small impact on Alaskan residents dependent on these trees. As a part of her PhD program, author Lauren Oakes set out to study the death of the yellow-cedars: to investigate the scale of the issue, to assess the local impact of the losses, and to try to predict the future of these forests. Oakes takes us through this research study as she and her team fight the damp and cold of the Alaskan wilderness to gather data. She provides a thorough, yet layman-approved explanation of the scientific methods they used and outlines her interview process with Alaskans. She aimed to understand every consequence the death of the trees would have on this community whether it be economic, cultural, or even spiritual. At times this book reads like a nature detective novel with Oakes never revealing her hand too soon. The structure and prose insist that we go on this physical and emotional journey with her. As she describes, her PhD stripped away the humanity of her experience in Alaska, reducing her findings to charts of data. This book is the other side of that coin: the side with the human face. By far, the most emotionally resonant portions of the book are her conversations with Alaskans and her fellow scientists about what the loss of the trees mean for the fate of humanity. The tree death is seen by many as the canary in the coal mine, or an indicator that humans have reached a point of no return. 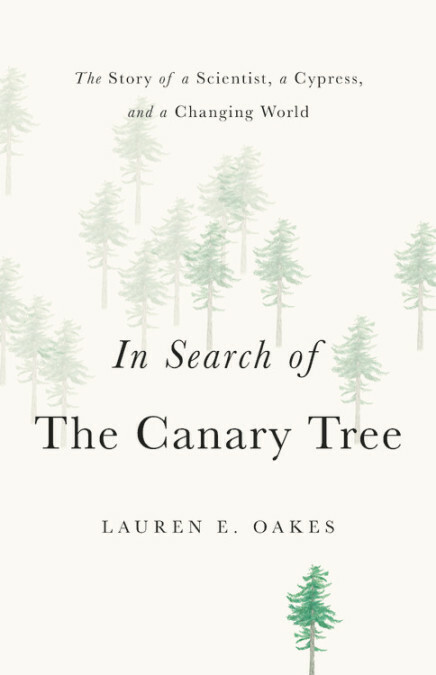 Indeed, deeply embedded in this text is an aching sense of loss: the loss of the trees, the loss of Oakes's own father during her PhD program, and the losses humanity will face in the absence of action. In a study published in 2000...a psychologist studying human-environment relationships found that an individual's perceived responsibility for the environment is greatest at the neighborhood level and decreases as the area become more remote. When it comes to climate change, that means acceptance starts by understanding what's happening in our own communities. In this book, Oakes makes the effects of climate change tangible; she allows you to reach out and touch its consequences with your fingertips. She presents the devastating impacts on real people and the ripple effect on the ecosystem. She demands the reader consider his or her own connection to the environment since most of us are dangerously removed mentally from the natural spaces in which we live. By writing this book with deep and complex emotion, she provides the critical first spark of making climate change feel like a personal problem in each of our lives. It's a call to arms to think about the changes necessary in our own neighborhoods to give us the perspective and empathy to do our part. To Oakes, the tree is not just a harbinger of doom, but a “window into our future.” It provides a glimpse of how the Earth will look as the wounds of human carelessness begin to scab over. By turning her PhD program experience into a memoir, the author strives to translate her hard-earned data into something actionable. It is clear that she aims to inspire all of us to see the way forward, however undesirable that path may look at the present moment. It is an achievement that a memoir standing in the melancholy shadow of climate change can leave the reader invigorated with optimism and faith in the future. Oakes is filled with pure resolve, determined to focus on what must be done to prepare for the new world climate change will inevitably shape for us. We, she says, can make the choice to adapt. One can only think Darwin would approve. Olive Fellows is a young professional and Booktuber (at http://youtube.com/c/abookolive) living in Pittsburgh. Olive Fellows is a young professional and Booktuber (at https://www.youtube.com/user/olivejuice1026) living in Pittsburgh.